Lose That Girl: RATE IT! More NHL for Canada! RATE IT! New Twist to "On the Rocks"
RATE IT! More NHL for Canada! RATE IT/HATE IT! For Mother's Day? RATE IT! Enchanted April -- TODAY! The news of the financial demise of the National Hockey League's Phoenix Coyotes has been met with unbridled enthusiasm by my fellow Canadians. The mega-rich Canadian head honcho of Research In Motion, Jim Balsillie has the brains & the cash to move this crippled and fan-starved franchise up to our Southern Ontario neck of the woods where it would be virtually guaranteed a thriving bank balance *and* rabid fans filling the seats. As a Toronto Maple Leafs fan, I think it's a smashing idea! Some healthy hockey competition in the province, more opportunities for fans to see games in person... and another rightful home for the game -- OUR GAME -- on our turf. So what's the problem? The NHL's troll of a Commissioner, Gary Bettman. Small man, small mind. Wee Gary hates the idea of teams fleeing from the US. Mr. Bettman has turned down Balsillie's previous attempts to swoop in & rescue troubled American-based NHL teams, bringing them back to life on Canadian soil. It's time for Gary to wake up! The NHL is not popular in most of the States. It ranks far behind the NBA, NFL, baseball, car racing... even college sports. Forcing teams into territories that have never ever seen a hockey puck is not going to make the sport grow down south. Some locales were just not made for hockey -- and for Phoenix, regardless of the involvement of Wayne Gretzky -- the BEST PLAYER EVER -- there's no hope in hell of reversing the bleed of cash and fans. 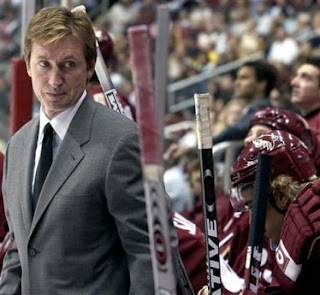 Today there are court-based hearings regarding the troubled Coyotes. Word is rife that Gretzky may step in & help Balsillie's cause. Wayne may work in the US but he's still all Canadian. Let's hope that he helps bring the club up to Ontario where it will be successful & wanted.